6 steps! Far too many for quick switches between players. This sits poorly against the games apparent attempts to encourage group play. Whenever someone new enters the game, the other players are told of this, and says how good it is to play Wii Fit together. The game encourages people to play it together, in spite of the effort required to do so! Wii Fit 3? Ensure there's a shortcut to change between profiles. People are sensitive about their weight. They don't like to tell others, and they don't want others to know. But when first joining Wii Fit, it announces your BMI for the whole world to see! There is no option NOT to see your BMI, it is plastered all over the TV. Anyone else in the room will have seen it. Wii Fit 3? Offer new players the ability to NOT see their BMI when they join. When My girlfriend and I were playing Wii Fit, 1 of us did the exercise on the balance board, the other did the exercise alongside. We were exercising together. That's the next step... 2 balance boards on a machine at the same time. This would encourage us to use Wii Fit and exercise far more than any other change. 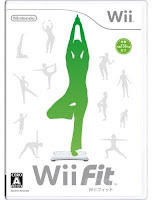 Wii Fit 3? Make sure people can exercise in a pair, using 2 balance boards at once (if they're sufficiently monied to have 2 boards). I really like Wii Fit. It's fun, and it really would keep me active. Anything to get my rotund behind moving is fine by me! BUT I'm not going to be getting it. Partly for the reasons above, and also partly because the game needs a large amount of space in front of the TV. I don't have that, and I can't get that... at least until I next move house. Also, it's dependent on everyone around having a relaxed open attitude. To play Wii Fit in front of others is essentially to make a fool of yourself. You do yoga, poorly, you try and balance, you wobble, and you sweat. You need people around you who are willing to let you do all these things and not judge you. Alas, where I currently reside, I don't have these people. I can't exercise if front of my current housemates, I won't be able to relax. I'll feel like I'll be judged. Ah well, just means I get to play it once a month whenever I visit my brother. No losing weight for me just yet.